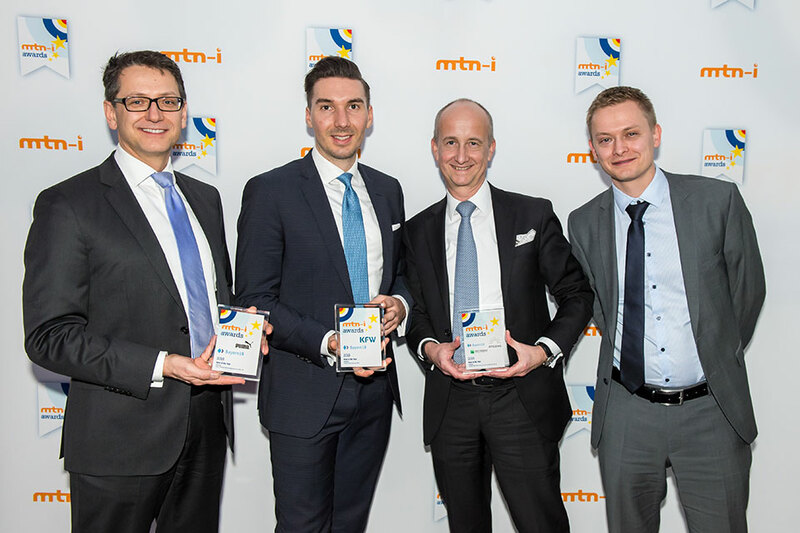 Not one, not two, but three BayernLB transactions were declared “Deal of the Year” at the 2018 mtn-i Awards ceremony in London on 7 February. An entire array of outstanding banks vied for the coveted title, which is awarded in 11 different categories in recognition of the top medium-term note transactions. The jury is comprised of capital market specialists from the international news and information portal MTN. “We are very proud to be awarded as many as three ‘Deal of the Year’ titles for the year 2018”, said BayernLB Board of Management member Ralf Woitschig, who oversees the Bank’s capital market business and the BayernLB Group’s treasury and financial institutions operations. In 2017 BayernLB won the mtn-i award “Schuldschein Dealer of the Year”. This time around, a transaction in the “Rate Structures” category has been declared “Deal of the Year”, as have two transactions in the “Schuldscheine” category. “Having two Schuldscheine and a floating-rate note conferred these awards is a nice confirmation of our years of experience and capital market expertise”, admitted Woitschig. “For years we’ve been achieving markedly overproportional order book rates and provable success for our customers through our transactions”, he added. For green Schuldscheine as well BayernLB has proven its placement power: one of the prized transactions is a green Schuldschein. “We placed the first green Schuldschein and now have an excellent track record in green and sustainable finance”, said Woitschig.